2009 Greenberg Memorial Day Car Show, Cambridge, MN. This club is open to all AMC and related make vehicles, and anyone with an interest in AMCs. (Car ownership not required) This is a “No Politics Club” for the enjoyment of the members and their vehicles. 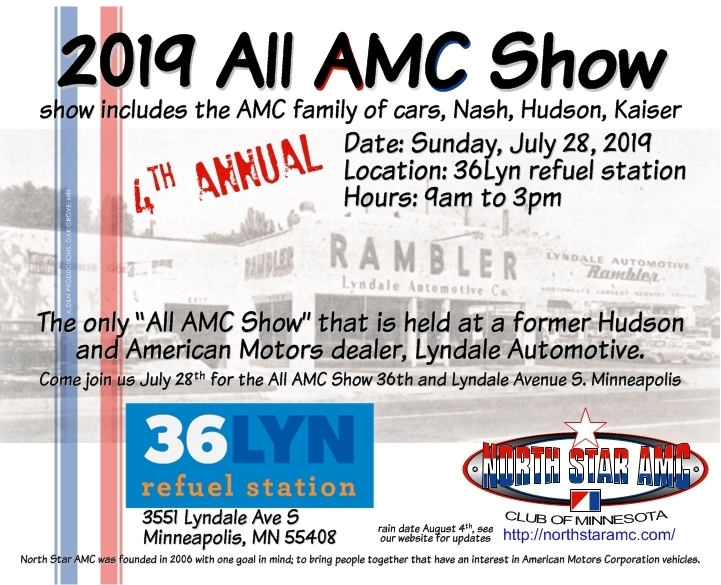 North Star AMC was founded in 2006 with one goal in mind; to bring people together that have an interest in American Motors Corporation vehicles. Annual membership is only $20. Contact us with any questions you may have, or join us at one of our meetings or events and see what we're all about. Just check the calendar for notices of upcoming meetings and events. Welcome to our new site. It is constantly under construction and will be updated as we see fit You will notice many new and exciting features. Please let us know of any problems or issues you may have as we go forward with the new site design. Some of the new features are the calendar, ready to keep you up-to-date with the latest in North Star AMC meetings, picnics and car shows. Members can also add pictures of their cars and families on the photo page, buy and sell parts, as well as chat about AMC related stuff in the forums. Members can also view old AMC TV commercials, print ads and video clips of AMC vehicles used in movies in the document library, as well as upload their own video clips to share with others. Future features will include the ability to renew your membership online, purchase items from the AMC store, and more. Winter Meetings are held on the third Tuesday of November, December, January, February, March and April, at 6:00pm (locations vary). Unless specified, will be trying to do some weekends for members that cannot attend weekday meetings. Summer Meetings are member hosted "Potluck Picnic Meetings" which are held May thru October. These are hosted by members, at different locations throughout the state, usually on a Saturday. We have members from MN, WI, ND, and Canada, so we try to vary the locations to make it easier for everyone to attend a meeting at some time. It's a good reason to take a road trip, show off your car and enjoy the food and camaraderie. Because of the advanced dates, be aware, they are subject to change. We'll try to give plenty of notice, should this ever happen. Be sure to check the calendar for advance notices of upcoming meetings and events.